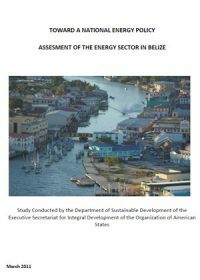 This report describes an in-depth study conducted by the Department of Sustainable Development of the Executive Secretariat for Integral Development of the Organization of American States, on the energy sector in Belize. The study provides a baseline analysis of Belize’s energy sector. It outlines a preliminary draft of Belize’s energy policy, including priority areas, broad goals and specific objectives for the development of the energy sector linked to security of supplies, environmental protection and competitiveness.